Gaining and keeping Momentum is an important part of any ERP Implementation. Momentum can be difficult to gain and it’s easy to lose. Momentum is an important part of any ERP Implementation. Unfortunately, momentum can be difficult to gain, yet it’s easy to lose. A Project Manager might put together an excellent, comprehensive Project Plan for an ERP Implementation, complete with a fancy looking Gantt Chart. Yet, they still might struggle to gain momentum on the project. It’s definitely important to have a Project Plan. But executing that Plan requires momentum. If you have ever had to push a car, then you have definitely experienced momentum. A few times in my travels I have encountered stalled cars. If they are blocking a lane or an intersection, I’ll get out to help move it. You just have to explain to the driver that they need to put the car in neutral. If you get out of your car, especially when there is a line of cars behind the stalled car, the chances are pretty good that someone else will jump out to help too. When you start to push the car, it’s difficult. But, once the car starts rolling, it gets a little easier. Eventually, you are running to keep up with the car. I took AP Biology in high school in place of Physics and somehow avoided taking Physics in college, even though I was an Applied Mathematics major. But I know Newton’s first law of motion: An object at rest stays at rest and an object in motion stays in motion with the same speed and in the same direction unless acted upon by an unbalanced force. Momentum in an ERP Implementation is just like momentum in pushing a car. It’s difficult at first, but it gets easier the more you stick with it. Personally, I think that there are two components to this. First, a physical component which I’ll talk more about in the next section. Second, a neurological component which I’ll talk about now. I’m not a brain expert, but I have a brain. And I’ve lived with my brain long enough to understand some things about how it works. My brain works kind of like a computer (but much better, take that you dumb artificial intelligence machines). There is a part of my brain that has recently accessed memories. And a part that still has memories, but it needs help to extract them, like when I spend some time with an old friend and talk about the good old days. The recently accessed memories are right there, on the tip of my tongue, effortless to access. Then there is a muscle memory component. I like to call this “getting the knowledge from your brain to your fingers.” This is especially relevant with ERP Systems and Computers because your fingers just know what to type and where to click without even having to think about it once you get used to a new ERP System. I still experience this in a weird way. A few years ago I learned a keyboard layout called Colemak. So I don’t use the traditional QWERTY keyboard layout anymore. It makes typing a lot easier for me. But, when I go into a Linux prompt (which I still have to do unfortunately when dealing with some maintenance issues on this website) and type a command, my fingers still type in QWERTY. It’s really weird. I have to really slow down to get it right. The only thing that makes sense to me is that my brain is not sending letters to my fingers. It’s simply asking for my fingers to type a command. And my fingers know how to type it. At least they know the QWERTY way of doing it. All of that, of course, is at a basic, or “cellular”, level. Extract that out to higher levels of an ERP implementation like discussions about how to implement a module, communication between multiple team members, or (even more difficult) communication across multiple departments. And you can see why momentum is critical in an ERP Implementation. 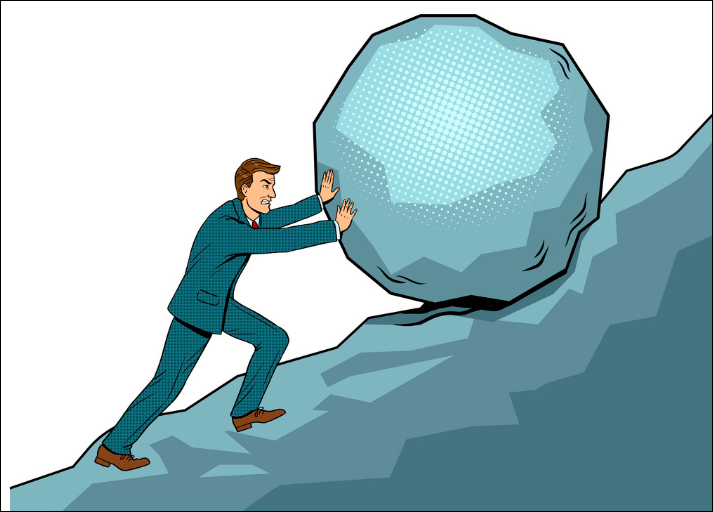 So, if momentum is so important in an ERP Implementation, how do we get momentum? And even more importantly, how do we keep momentum? I’m not expert here, just a professional learner. So these are just my current thoughts. I’m sure this will evolve over time. Back to the “physical component” of momentum on an ERP project that I mentioned earlier. One of the hardest things to deal with during an ERP Implementation is the fact that the people working on it have regular jobs too. The ERP Implementation is like a second job for them. For this reason, I don’t find task lists or open item lists very useful in and of themselves. They can easily just sit there and collect dust. Everyone knows that they have things that need to be done, but it’s hard to find the time. The lists are important, but they don’t magically create momentum. In my opinion, setting a “cadence” expectation is an important step toward gaining momentum. “Cadence” just means the pace, like a drum beat, that you are “marching” to. ERP Implementations are a marathon, not a sprint. So you can’t set the cadence too fast. But the cadence still needs to be set. There needs to be time slots blocked out on people’s calendars. Maybe you only block out time a couple of weeks in advance. But the more you block out time, the more you become accustomed to spending time on the ERP Implementation. And you begin to gain momentum. Once you do this for a few weeks, you begin to learn what times work well for people. And you start to form a habit. Maybe it’s every Monday and Wednesday afternoon at first. That becomes “ERP Time” in people’s minds. Then when you get to user testing, you do the same thing by blocking out time on everyone’s calendars. You might even use a change in location tactic by putting everyone in the same conference room. Then their brains start to associate that conference room with the ERP Implementation. Gaining and Maintaining Momentum on an ERP Implementation is very important. More important than installing the software? More important than cleansing the data for data import? More important than setting up security properly? Well, I would say “yes”. Because without momentum, none of that stuff will happen.